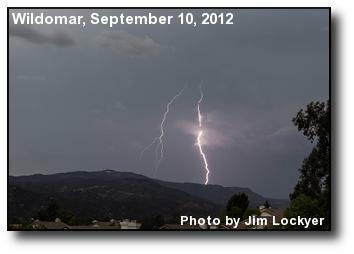 September Lightning: Lightning over Elsinore Peak as the storm cell drifts west. 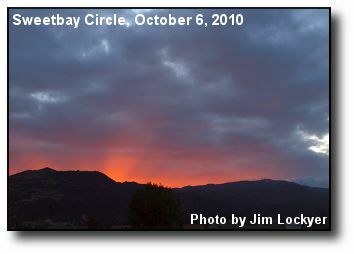 Photo courtesy of Jim Lockyer. 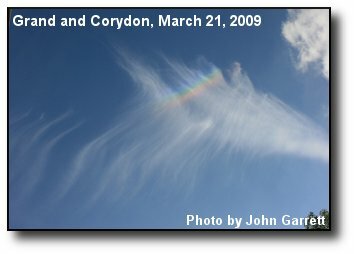 CircumZenithal: Some color like a rainbow in the sky, from ice crytals aloft. Photo courtesy of John Garrett. 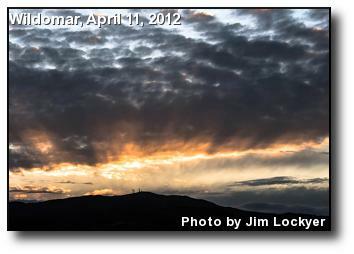 Peak Sunset: The sun setting over Elsinore Peak, in the Santa Ana Mountains. Photo courtesy of Jim Lockyer. 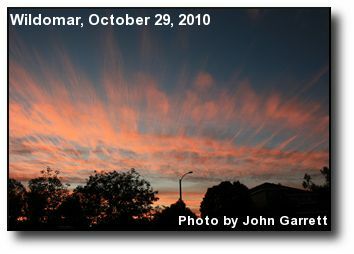 Fall Streaks: Ice crystals, cirrus clouds and wind shear combine to make an interesting cloud formation. 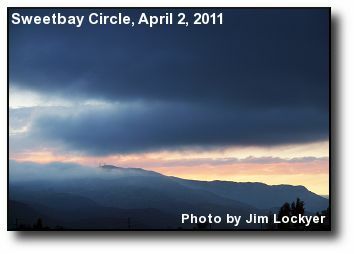 Photo courtesy of Jim Lockyer. 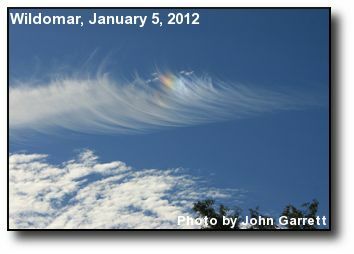 Morning Sundog: A bright spot in the Wildomar sky on a winter morning adds some extra color. Photo courtesy of John Garrett. 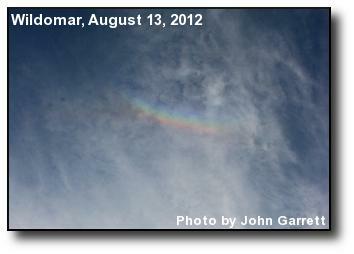 Circumzenithul Arc: A fragment of an upside down rainbow in the inland sky. 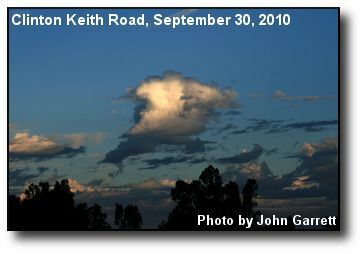 Photo courtesy of John Garrett. 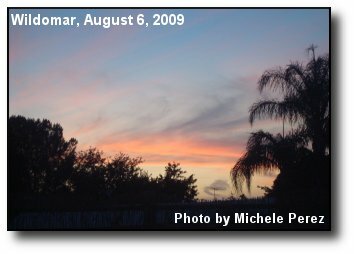 Pastel Sunset: Santa Ana wind conditions provided a pastel sky for the sunset. 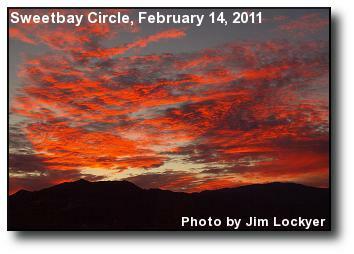 Photo courtesy of Jim Lockyer. 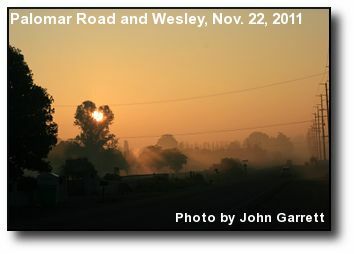 Morning Fog: Ground fog rises like mist below the rising sun. Photo courtesy of John Garrett. 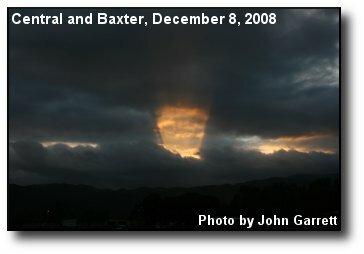 Eastern Rays: These anti-crepuscular rays, converging in the east are opposite the setting sun. Photo courtesy of John Garrett. 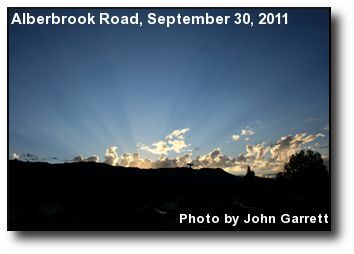 Sun Rays: Crepuscular rays brighten the sky at sunset. Photo courtesy of John Garrett. 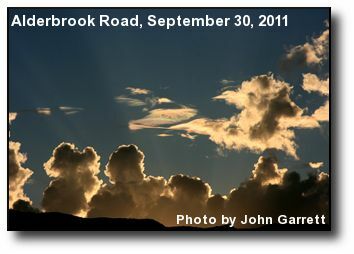 Irridescence: A view of irridescent clouds with crepuscular rays. Photo courtesy of John Garrett. 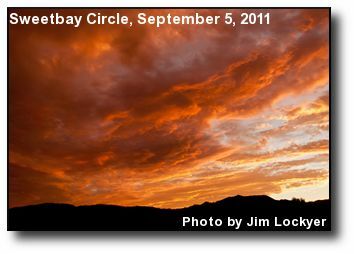 Fiery Sunset: Red and orange colored clouds dominate this late summer sunset. 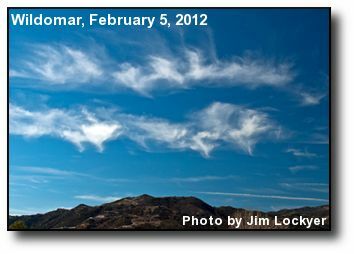 Photo courtesy of Jim Lockyer. 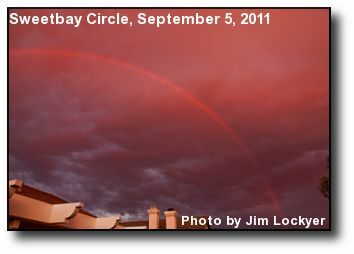 Sunset Rainbow: The colors of sunset mix with a rainbow over the Wildomar sky. 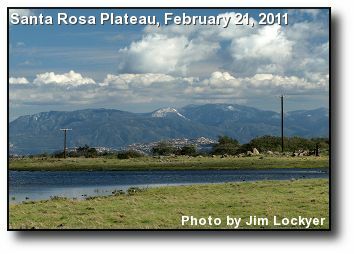 Photo courtesy of Jim Lockyer. 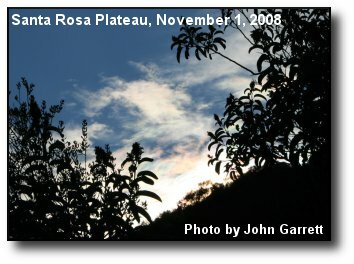 Sunset Watcher: A lone hummingbird watches colored clouds at sunset. Photo courtesy of Jim Lockyer. 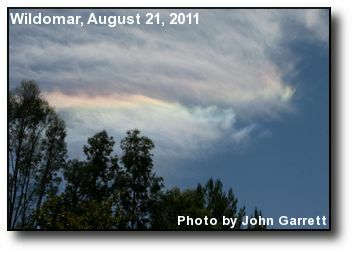 Ice Halo: A circumhorizon arc (or ice halo) in the Wildomar sky, formed by ice crystals in cirrus clouds refracting sunlight. Photo courtesy of John Garrett. 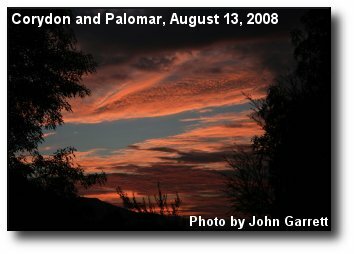 Sunrise Colors: The mountains at dawn, to the east of Wildomar. Photo courtesy of John Garrett. 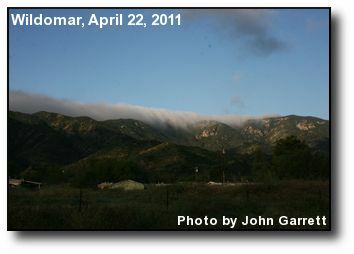 Mountain Hug: Morning marine layer clings to the hills west of Wildomar. Photo courtesy of John Garrett. 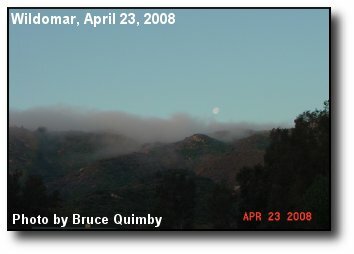 Moonset over Low Clouds: The moon floats above the marine layer as it recedes over the Santa Ana Mountains. Photo courtesy of John Garrett. 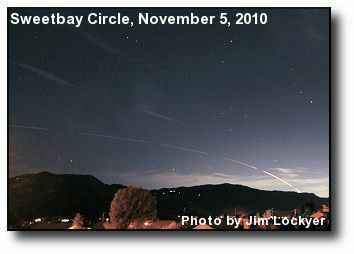 Evening Launch: The contrail of a Vandenberg AFB rocket launch, in line with Orion's belt. 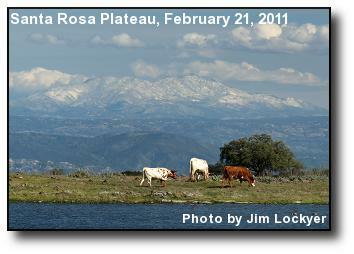 Photo courtesy of Jim Lockyer. 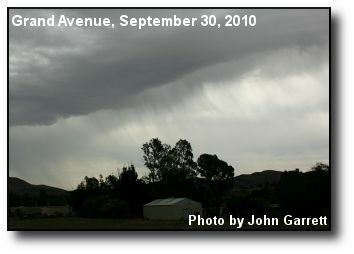 Virga Clouds: Fingers of moisture reach down from the sky as a storm system passes through. Photo courtesy of Jim Lockyer. 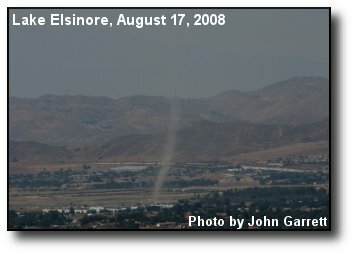 Elsinore Peak: Clouds flow below and above the radio towers on Elsinore Peak, west of Wildomar. Photo courtesy of Jim Lockyer. 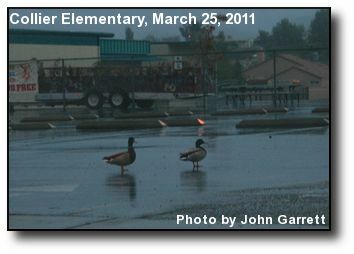 Duck Weather: A couple of ducks enjoy the wet weather in the Collier Elementary parking lot. Photo courtesy of John Garrett. 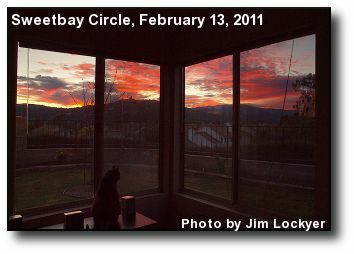 World Window: A housecat watches the world through a corner window, as the sun settles below the horizon. Photo courtesy of Jim Lockyer. 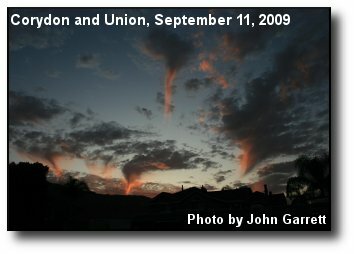 Glowing Clouds: Crimson and orange clouds show their colors at sunset. 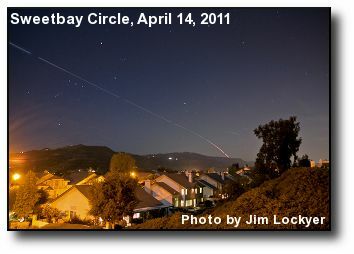 Photo courtesy of Jim Lockyer. 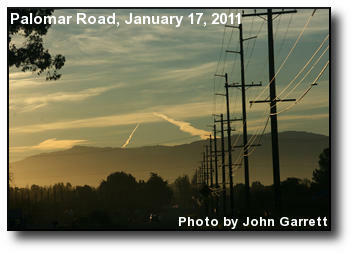 Morning Backlighting: Morning sun accentuates the low haze; Palomar observatory is visible between condensation trails. Photo courtesy of John Garrett. 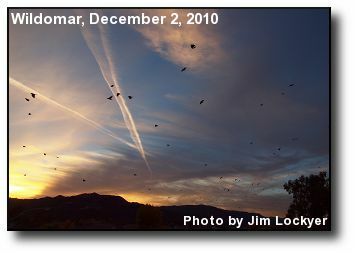 High Clouds: Formations of high clouds mark the last sunset of 2010. 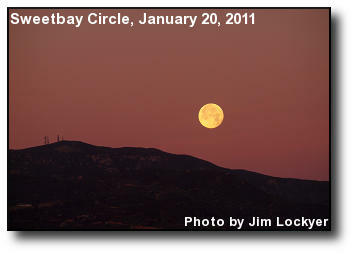 Photo courtesy of Jim Lockyer. 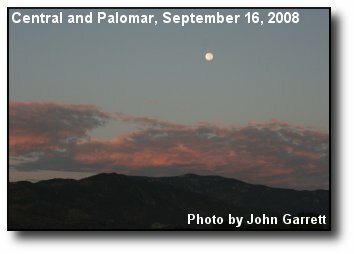 Morning Glint: A brilliant, fiery display of the morning sun reflecting off of windows throughout the south part of Wildomar. Photo courtesy of John Garrett. 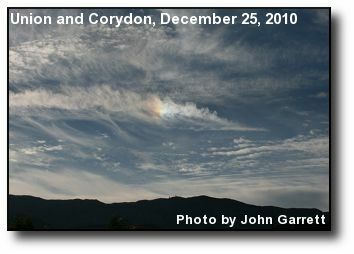 Christmas Sundog: A sundog in the afternoon sky, with the sun off to the left. Photo courtesy of John Garrett. 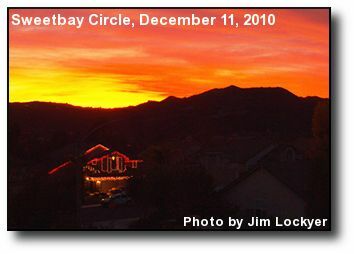 Holiday Sunset: Holiday lights illuminate a Wildomar house at sunset. Photo courtesy of Jim Lockyer. 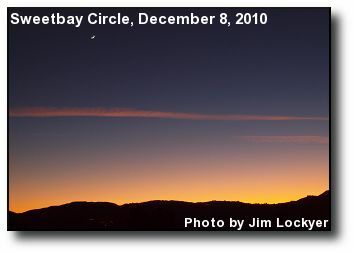 Crescent Moon: Contrails and the crescent moon low in the sky at sunset. 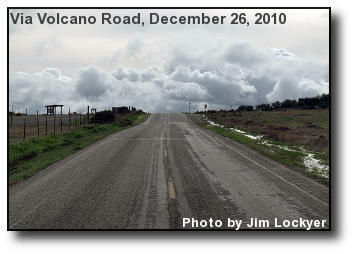 Photo courtesy of Jim Lockyer. 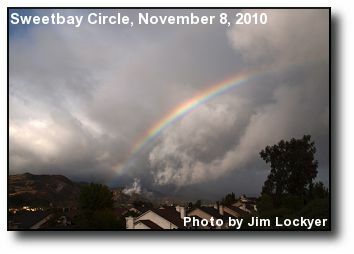 Rising Rainbow: A colorful rainbow rises past storm clouds in Wildomar. Photo courtesy of Jim Lockyer. 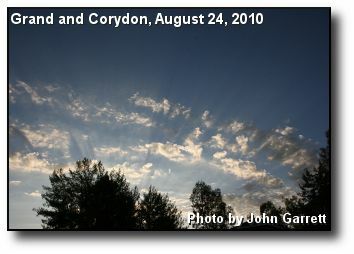 Radiant Sky: Cirrus clouds streak the morning sky. Photo courtesy of John Garrett. 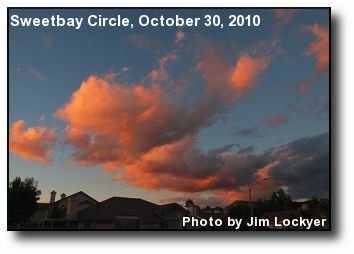 North at Sunset: Colored clouds float through the sky at sunset. Photo courtesy of Jim Lockyer. 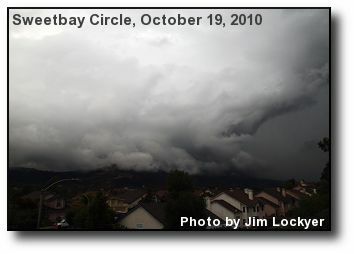 Storm Clouds: Gray clouds loom in the Wildomar sky. 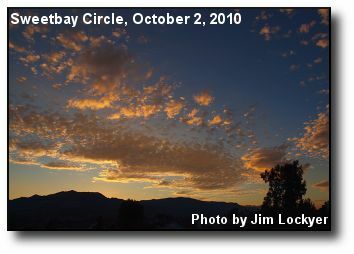 Photo courtesy of Jim Lockyer. 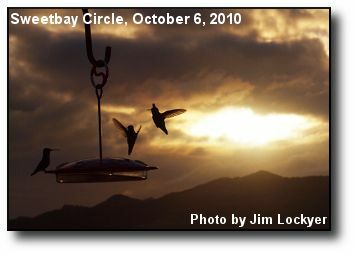 Sunset Feeding: Hummingbirds at a nectar feeder with the sunset as backdrop. 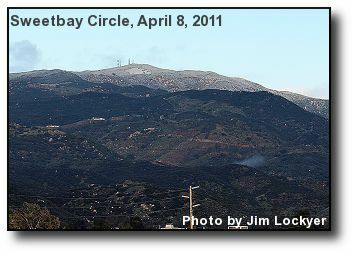 Photo courtesy of Jim Lockyer. 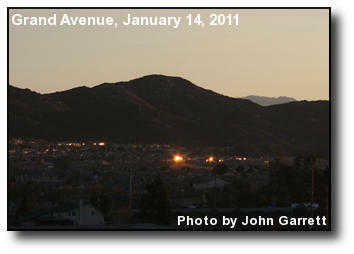 Pink Sunset: Sunlight glows from beneath Wildomar's western hills. Photo courtesy of Jim Lockyer. 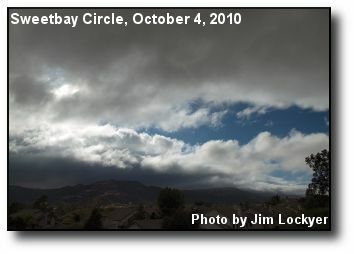 Stormy Weather: Dark clouds portend rain to come. 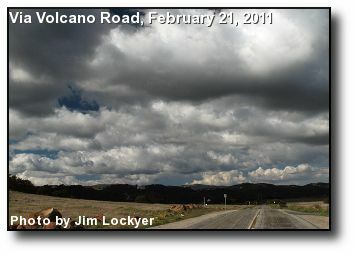 Photo courtesy of Jim Lockyer. 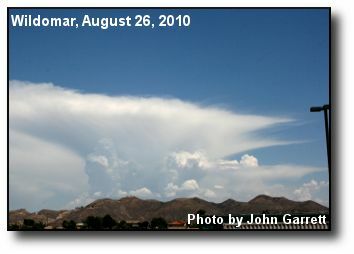 Exploding Cloud: This cumulo-nimbus cloud bubbles up into the sky east of Wildomar. Photo courtesy of John Garrett. 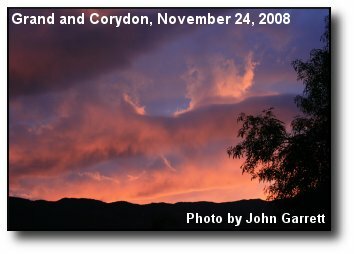 Warm Glow: An organish hue outlines the hills and clouds to the west at sunset. 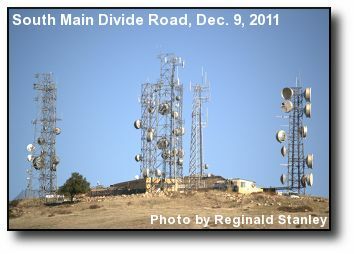 Photo courtesy of Jim Lockyer. 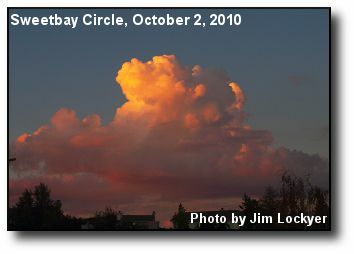 Cloud Buildup: A nimbocumulus cloud building to the east at sunset. 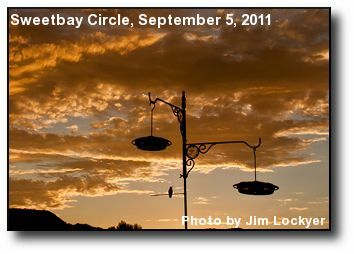 Photo courtesy of Jim Lockyer. 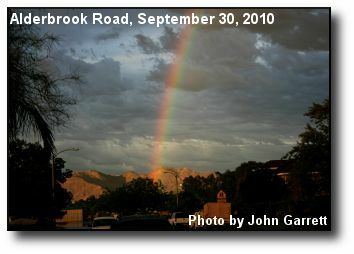 Bright Rainbow: This rainbow appear to end beyond a Wildomar neighborhood. Photo courtesy of John Garrett. 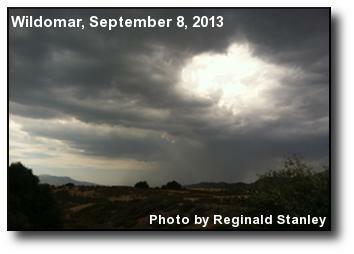 Sweeping Rain: Brushes of rainfall come down from the clouds over Wildomar. Photo courtesy of John Garrett. 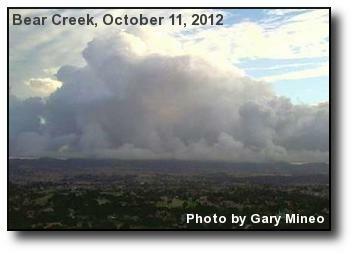 Incoming Clouds: A harbinger of showers later in the afternoon, clouds arrive over the Wildomar. Photo courtesy of John Garrett. 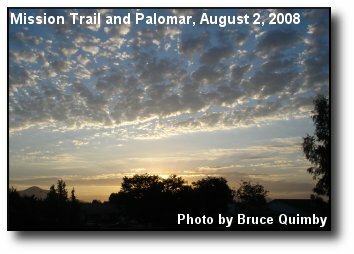 Crepuscular Rays: Sunrays at sunrise fan out against the Wildomar sky. Photo courtesy of John Garrett. 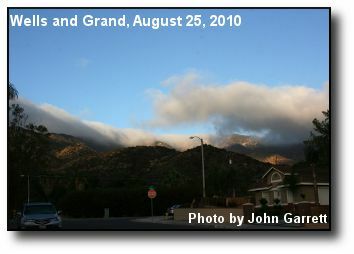 Cloud Bank: Morning marine layer hugs the western mountain ridge. Photo courtesy of John Garrett. 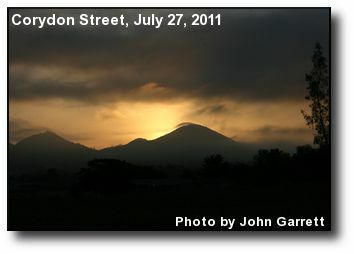 Gray Sunrise: The sun struggles to shine through morning fog in Wildomar. Photo courtesy of John Garrett. 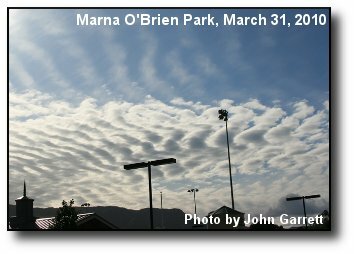 Herringbone Clouds: A wavy lines of clouds marches across the Wildomar sky. Photo courtesy of John Garrett. 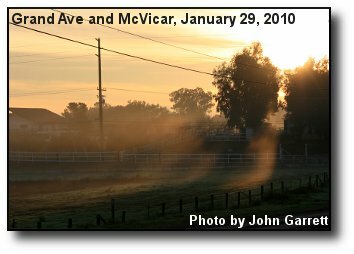 Sunrise Fog: Wispy ground fog greets the new day. Photo courtesy of John Garrett. 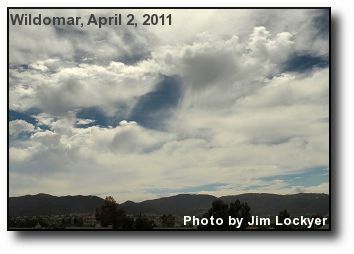 Virga over Wildomar: Cone clouds of water vapor reach for the earth. Photo courtesy of John Garrett. 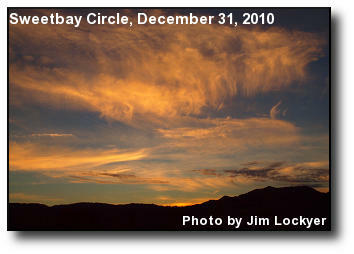 Wispy Sunset: Colorful fingers of clouds spread to the horizon at sunset. Photo courtesy of Michele Perez. 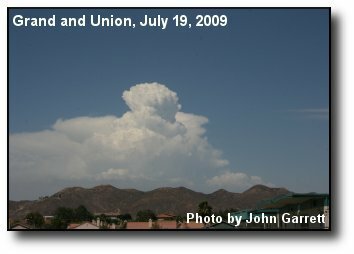 Monsoonal Updraft: A massive cumulous cloud to the east on a summer day. Photo courtesy of John Garrett. 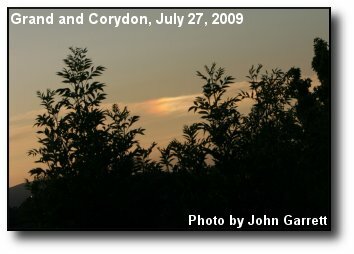 Sun Dog: Formed by ice crystals, a sun dog reminds us how fast the air cools with altitude. Photo courtesy of John Garrett. 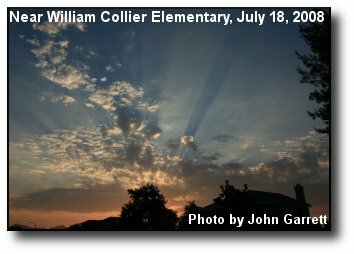 Light Rays: Crepuscular rays in the morning shine through the clouds. Photo courtesy of John Garrett. 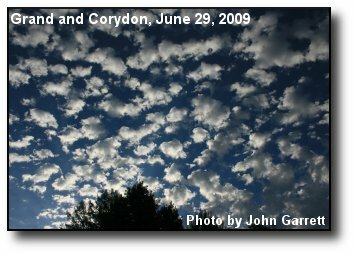 Puffy Clouds: A morning matrix of small clouds in the Wildomar sky. Photo courtesy of John Garrett. 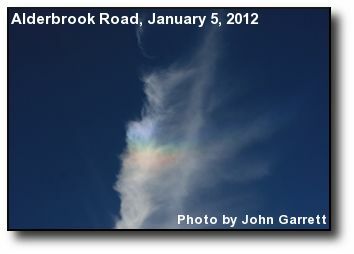 Optical Effect: This is a circumzenithal arc, an upside down rainbow created from refraction of the sun by ice crystals. Photo courtesy of John Garrett. 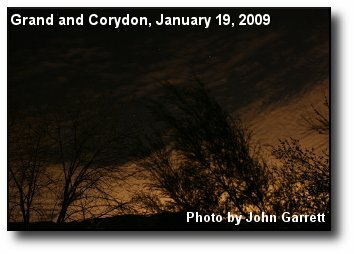 Night Glow: City light glares off of middle-level clouds, creating night-time contrast. Photo courtesy of John Garrett. 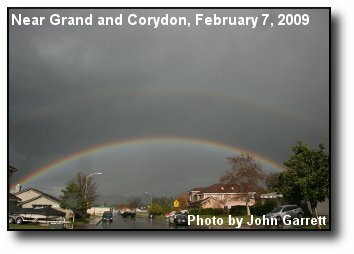 Double Rainbow: Two full bands of color, one fainter, appear during a storm in the Wildomar sky. Photo courtesy of John Garrett. 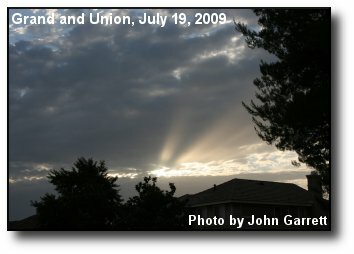 Crepuscular Ray: A gap in the clouds produces a bright upward ray of light. Photo courtesy of John Garrett. 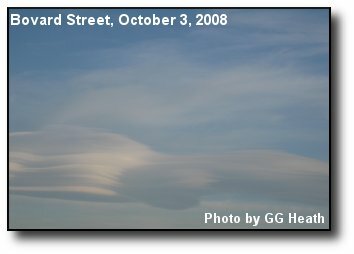 Weather Change: Cloud formations mark the beginning of a wet, cold period. Photo courtesy of John Garrett. 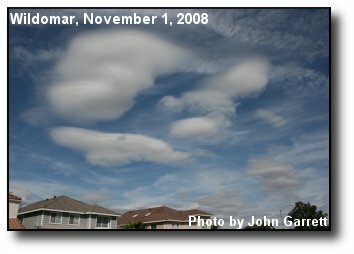 Orographic Clouds: These clouds over Wildomar are shaped by the mountains to the west. Photo courtesy of John Garrett. 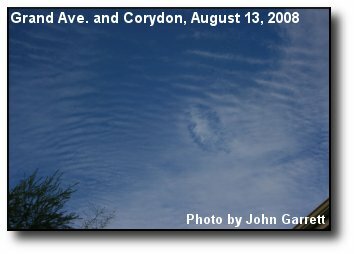 Ribbon Clouds: A ribbon pattern floats across the inland sky. 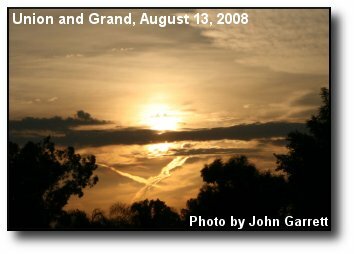 Photo courtesy of GG Heath. 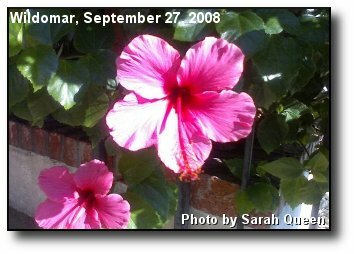 Vibrant Bloom: Pink hibiscus brighten a front yard garden. Photo courtesy of Sarah Queen. 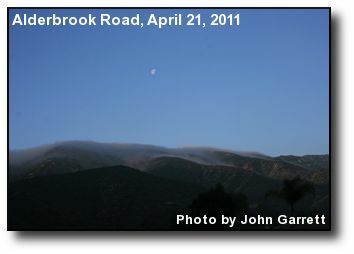 Morning Moon: The setting moon settles above the western hills. Photo courtesy of John Garrett. 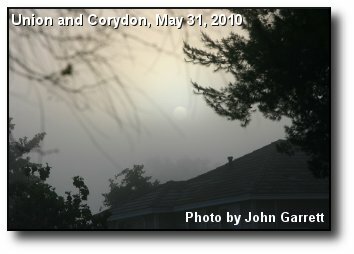 Sunrise Corona: A corona glow around the sun and accompanying clouds at sunrise. Photo courtesy of John Garrett. Framed Sunset: Layered clouds and trees frame the colors of sunset. Photo courtesy of John Garrett. 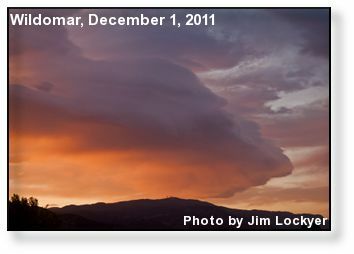 Sunrise Clouds: Scattered clouds at sunrise captured from central Wildomar. Photo courtesy of Bruce Quimby. 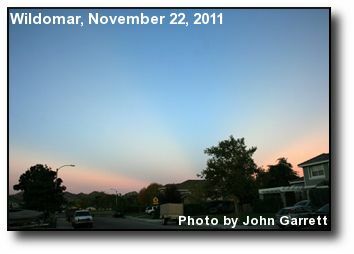 Sun Rays: Morning crepuscular rays over the Wildomar sky. Photo courtesy of John Garrett. 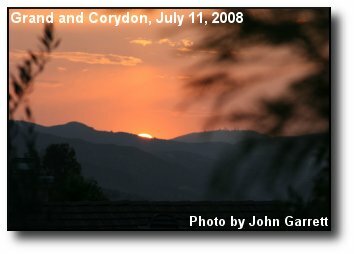 Setting Sun: A summer sunset over the hills west of Wildomar. Photo courtesy of John Garrett.